How far along? Thirty-two weeks! Just under two months left. Time seems to be going so fast and so slow at the same time. How big is baby? She measured 4lbs and 9oz today. About 3 days ahead of "schedule". We had the ultrasound tech double check...It's still a girl! Whew! Total weight gain: My at home weight gain shows 40ish lbs. I think I've only gained 3-4 pounds this month and it's all in my belly. I'm not sure if the midwife was joking or not, but she said something about 12 pounds of water weight trapped in my legs! It's funny but it's not. Maternity Clothes? As promised I haven't bought anything since my last post. I am really hoping we don't have a cold Fall because I don't want to buy new clothes or shoes. Stretch Marks? They have consumed my abdomen, hips, and inner thighs. I'd complain, but it's all areas I cover up anyway. I am thankful that I haven't had any on my arms or back, I would be even more self conscious that I already am about those areas. I am also surprised to not have new ones on my breasts, just the souvenir ones from puberty. Exercise: I wouldn't call anything in the last two weeks as intentional exercise, but I have been very active. Hardly any down time just sitting. It's been a great balance because I sleep better at night, and it keeps all my hip and back joints from locking up, which is exactly what the doctor ordered. Sleep: Most nights I go to bed around 11 and get up at least once, sometimes two or three times to pee. I am up anywhere between 6:30 and 8:30 depending on the day. I have my head pillow, candy cane shaped boddy pillow (which we call J-lo), and some nights a bigger pillow for me to hug. By hugging the big pillow it helps keep my hands and arms from falling asleep. The carpel tunnel has been getting even stronger and more frequent. Movement: I'd say we have a real ninja on our hands, but ninjas are more stealthy than baby girl. She is more like a break dancing ninja turtle. Go ninja, go ninja, go! She moves to remind me to eat. I just imagine her saying, "Hey mom, I'm hungry" *POW* Her favorite meal is dinner and anything sweet. Both seem to make her extremely active. And of course bedtime...She's kept me up for hours at night with startling moves. I had a few upper cuts to my right rib this week. Yowzers! Food cravings: Still on a fruit kick, mostly melons, grapes and apples. And I love every variety of gluten free Chex cereal!!! I am back to having a few food aversions - anything with a bone, cooked spinach, and seafood. What I miss: Not having carpel tunnel. Sleeping on my stomach (I almost did a belly flop on the bed the other day. D'oh!). REAL SHOES! Running. Biking. 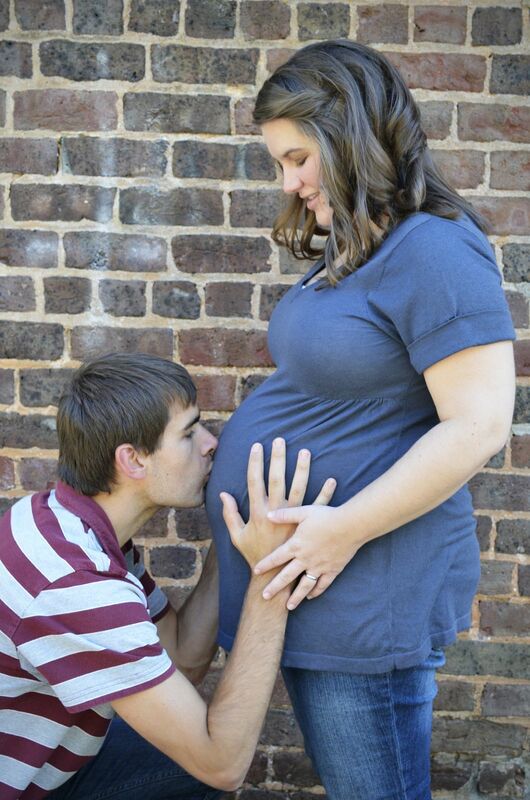 What I am looking forward to: Meeting our precious daughter. Holding her. Watching Eric hold her. Giving her a name. Getting to know her. Being a little family. Snuggles. Baby kisses. I can hardly reach my feet to shave or put on complicated sandals. I fell asleep at work. My boss woke me up because I was SNORING! We're getting a little closer to choosing a name. We each have a front runner. One has two distinct nicknames. The other name doesn't really have any nicknames, but is sweeter sounding to me (which is why it's my favorite!). "Connor, do you want to feel the baby in my belly?" "I just can't wait to meet her"
"Yeah, but she's gotta keep cooking. Otherwise she'll have a gooey middle"
One night while I was putting cocoa butter on my belly, Eric said, "I have a new nickname for her, 'Butterball'!" "Yeah, because she's due around Thanksgiving, like a turkey. And you are always buttering her up"
"You're having a baby? You're so lucky!" "Yeah, my mom said I can't have a baby until I get married. And that'll be a loooong time. I don't even have a boyfriend yet.....and I'm 26!" Make room for baby: I snuck a few baby things in the wash, namely the decorated onesies, two hats, two socks, a swaddler and a receiving blanket. All things we'll take to the hospital or need right away. I sent this picture to Eric with a note that said, "LOVE!" We received tons of goodies the last two weekends at our showers, including the crib bedding, stroller (that was the big surprise box), diaper bag, a few cloth diapers, and lots of clothes, shoes and other little things. I am waiting to see what other gifts receive before I take tags off and wash things. And if she's measuring big, I probably won't keep too many of the 5-8 pound newborn clothes around. Just the "Mommy's little turkey" outfits for Thanksgiving. Um, what's up with all the ear wax?! I mean, seriously. Not a pregnancy symptom I've ever heard of, unless it's the fish oil or magnesium supplements I've been taking?!?! Time to lay off the salty foods. My water retention is getting a little high, which is causing my blood pressure to spike. If we want to follow through with our birth plan it's time for high protein, fruits, veggies, and nice long walks :) Diane, the midwife, said "Keep your eye on the prize!!!"